A small sheet of foam/rubber, an embroidery hoop, fabric, spray adhesive, a craft knife, pencil, needle and thread and... rings! 1. Start by tracing around the inside of the inner embroidery hoop on to your foam/rubber. 2. Use this line as a guide to cut out your circle. 3. Put your foam/rubber circle into the inner hoop and add your fabric over top. 4. Cut your fabric, making sure there is enough material to be able to secure it at the back. 5. 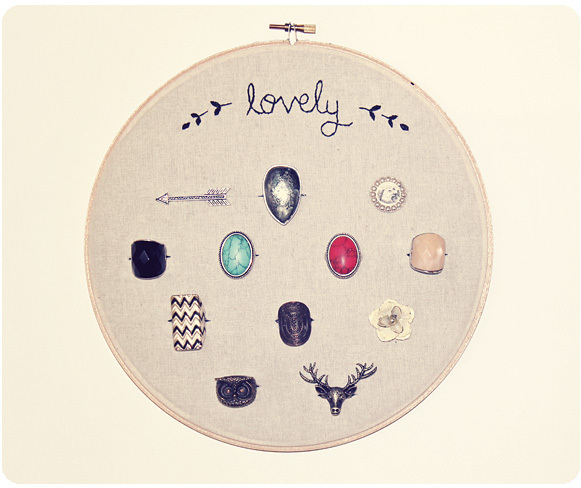 With a pencil, trace out what you would like to stitch onto your hoop. 7. Spray the back of your fabric with spray adhesive. Don't be shy here, if it doesn't stick to the foam/rubber very well then it will deteriorate when you take your rings in and out. 8. 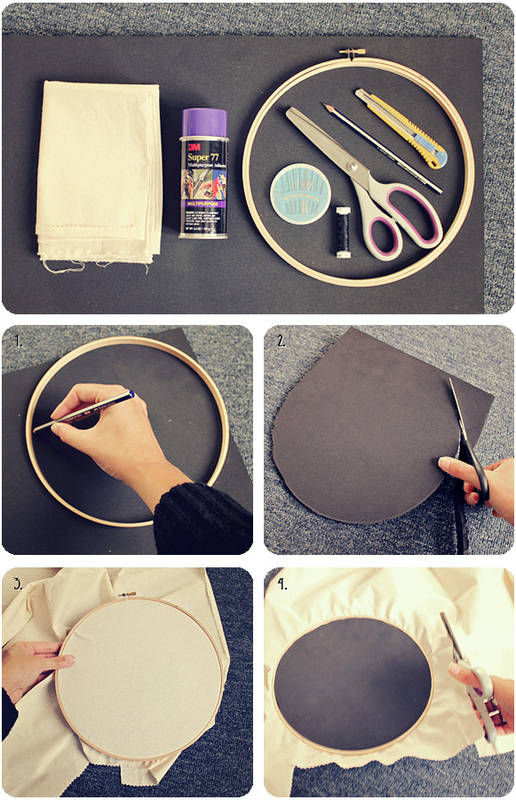 Attach your fabric to your embroidery hoop and make sure everything is tucked in at the back. 9. Mark out where you want to insert your ings. 10. Use a craft knife to cut slices where you have marked. I love this! Such an adorable idea, and I'm lovin the vintage chic vibe. I always lose my rings as well, so I'm so glad I stumbled upon this solution! I'm planning out my embroidery as we speak! Absolutely brilliant! 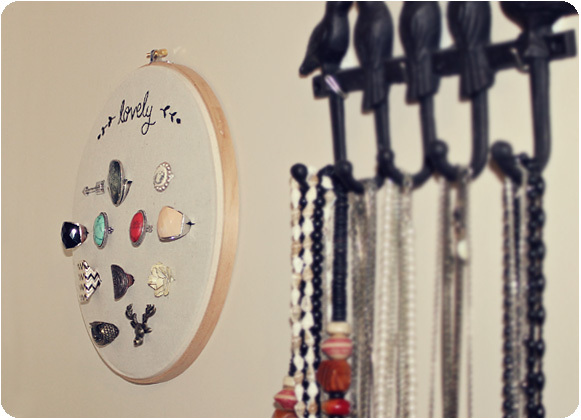 And it's so lovely and customizable, I would totally make this for a friend. 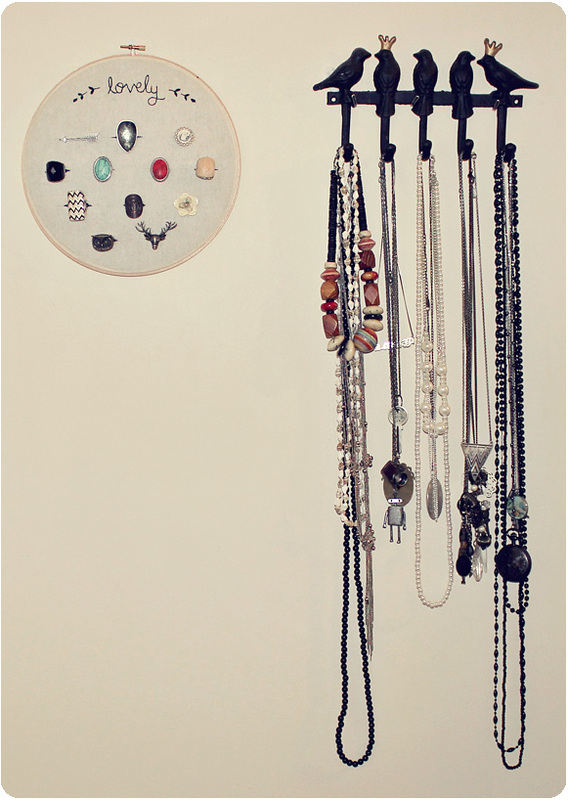 Everyone's always looking for pretty ways to display jewelry! This is super pretty! I think I need to make one of these! I love this idea! I need a better way to organize my rings too! I need to stop losing them! Gorgeous!!! In need of a few of these! !